Are you a Disney fanatic? Just how fanatical are you? Are you one that brings your autograph book with you each time you visit because there are still characters you haven’t yet met? Is your Disney World bucket list full of characters that you absolutely have to meet on your next visit? If so, first of all, we agree—you really are a Disney fanatic (and we love that by the way)! But not all the characters at the parks are as accessible as others. And how are you ever going to get that autograph book full if there are some characters you’ve having trouble locating? Here are 10 of the most elusive characters at the parks and where you can find them too! The beloved prince-turned-beast-turned-back to prince can only be seen in his beastly form at Magic Kingdom. You can catch a glimpse of him during the Festival of Fantasy Parade at Magic Kingdom. You will also find him inside Beast Castle at Be Our Guest restaurant. He’s available for photos and hugs after dinner at the restaurant, but of course, you’ll have to be able to score a dinner reservation in order to see him. Note that Beast does not sign autographs during this encounter. If meeting Beast is utterly important to you, be sure to make your dining reservation at Be Our Guest 180 days in advance via the My Disney Experienceapp or by calling (407) WDW-DINE. Cinderella’s wicked stepsisters Anastasia and Drizella Tremaine are some of the most elusive Disney characters you can hope to meet at Disney World. When you can find them, they are at Magic Kingdom, either near Cinderella Fountain or near the Castle wall. They don’t make appearances daily, and on days when they do meet Guests, it is usually only for an hour or two. Meeting them is quite the experience, though, if you’re fortunate enough to find them, as they live up to their evil, snobby and arrogant personas. You can also meet them during the “Happily Ever After” dinner at 1900 Park Fare restaurant at Disney’s Grand Floridian Resort and Spa. Come for dinner and stay for the shenanigans and hijinks. But be sure you have thick skin—those girls can be really rude! She’s not necessarily trying to be elusive, but the beautiful strong-willed Scottish princess greets Guests in a tucked away location at Magic Kingdom. The red-headed heiress regularly meets adoring fans at Fairytale Garden inside Magic Kingdom. The difficult part is braving the queue to meet her and get her autograph. PIXAR’s only princess is a character who consistently draws large crowds of Guests lined up from Fairytale Garden all the way back to Cinderella Fountain. The queue can be somewhat deceiving initially, as it looks shorter than it really is. That’s because once you’re inside Fairytale Garden, you’ve still got a lengthy wait to get to meet Merida. 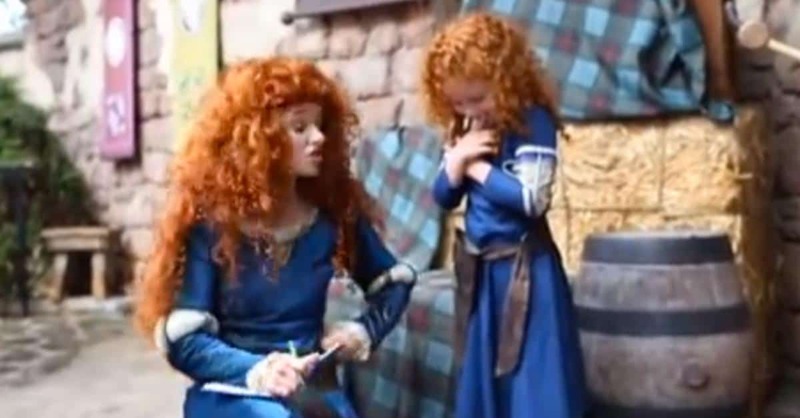 If meeting Merida is on your Disney World bucket list, it’s best to get to Magic Kingdom at opening and make her your first experience of the day. At other times of the day, you can easily find yourself waiting in line for 1 – 1 ½ hours, and much of that wait is not in the shade. Two of the emotions from Disney/PIXAR’s Inside Outcan be found at EPCOT at Future World. Joy and Sadness greet Guests and pose for pictures with them. They also sign autographs. It’s quite the conversation piece to experience Joy and Sadness at the same time! FastPass+ service is not available for this encounter, but the line moves fairly quickly so don’t miss out!